The leading experts in research against blindness will take part in the B-Debate forum Fighting Blindness: Future challenges and opportunities for visual restoration. To be held in Barcelona on 6-7 September, the event features two days of debate under the aegis of the Medical Director of the BMF: Research for Vision, Dr. Jordi Monés, with the support of the Centre for Genomic Regulation and the Leitat Foundation. 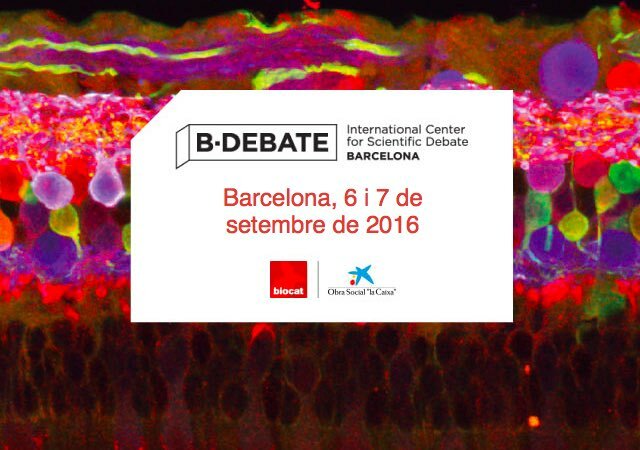 The B-Debate sessions serve as a connection with the scientific debate in Barcelona, organised by the La Caixa bank foundation and Biocat. Fighting Blindness: Future challenges and opportunities for visual restoration understands blindness as a great global challenge in the health field and places the focus on the fact that, in the coming years, one in every four people of over 50 will suffer some type of degenerative eye disease. The forum seeks to propose ideas and explore the new therapeutic focuses for retinal dystrophies, combined with techniques such as nanotechnology, regenerative medicine, stem cells, gene and genomic therapies or photonic sciences. It gathers basic and translational researchers together with global experts and leaders in all these fields in order to explore synergies that give rise to the creation of new multidisciplinary research projects. Registration for Fighting Blindness: Future challenges and opportunities for visual restoration is now open. Researchers who wish to present posters have up to 31 July to apply. To do so, or to register your attendance at the forum, please use this link.